Though with each passing month the newsstands are filled with new magazines, books, and articles promoting the latest weight loss or exercise “secret”, the truth is an unsung hero created a method of exercise a few decades ago that would help most folks gain the physical prowess and ability to burn fat they crave. His name was Leonard Schwartz and he, himself, was walked the path most of us face. Fat, out of shape, and a chronic smoker… he was no candidate to live as long as he did. Nobody would have ever guessed the slight psychiatrist would go down in history as an exercise visionary! Convinced in his 50’s of the need to change or die, he took up the recommended exercise protocol of his time: “aerobics”, i.e. “jogging”. That started to work. Jogging 1500 to 2000 miles per year, his racing heart rate slowly dropped from 80 beats per minute to 60. That was slow progress to him, but it was better than nothing. The reduction in resting heart rates indicated his growing fitness, yet he did not find it satisfactory by any stretch. About that time, a hamstring injury sidelined him. He was left needing to exercise aerobically, but unable to follow the medical advice of the day. He was forced to start searching for an alternative. He found his answer in the exercise research. Cross country skiers who used their arms AND their legs to exercise processed more oxygen and had greater aerobic capacity than any runner. So why did the “experts” only focus on using the lower extremities to exercise? He started to search for a way around his hamstring injury that made running impossible. Simultaneous Exercise – like those cross country skiers, the most aerobic benefit with the lowest level of perceived exertion comes when as much muscle mass is harnessed as possible. That means all four limbs are engaged and working together! Why? Because the arms and upper body are as effective “aerobic drivers” as the legs… and, because, compared to the legs, the aerobic capacity of the upper body has much more “upside potential”. In plain English that means lifting HeavyHands properly during a 2.5 mph leisurely walk easily make the aerobic effect of a slow walk comparable to a 6 mph job without hand weights! Mimicking a cross country skier (the “Double Ski Pole” exercise) is perhaps the most aerobically powerful single exercise ever tested by the University of Pittsburgh scientists who helped Schwartz prove his every assertion! Strength and Endurance – It wasn’t until Dr. Schwartz started working out with his “HeavyHands” weights that his heart rate moved below 60 down to the rate of approximately 40-50 beats per minute. When he added “strength moves” such as Double Ski Poling which he could perform with over 20% of his bodyweight for over an hour, his heart rate settled at 35 beats per minute! Oddly enough, his HeavyHands method called for deceptively low weights. While strength athletes might lift hundreds of pounds in the Bench Press, Squat, or Deadlift in single lifts, all but the most advanced HeavyHands moves could be done with weights under 15 pounds! 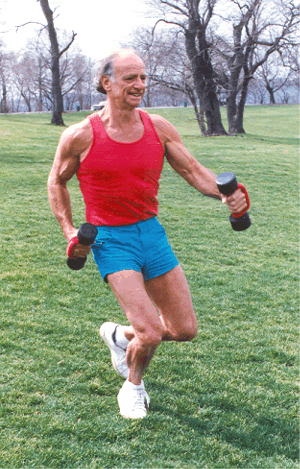 The difference is that Schwartz’ sculpted body, superior aerobic capacity, and great strength per pound (more on that later) came through high repetition exercise and increasing weight loads over time! In fact, at times the lower the weight, the better! Ideally, the weights would be lifted repeatedly to “Level 3″ (moved overhead from the starting position at the hip). The people who “tried” HeavyHands and found it inadequate (even supposedly sophisticated researchers) failed because, universally, they assumed the small weights were to be “carried” instead of hefted quickly and repeatedly throughout the course of exercise. Hopefully the first part has been answered. Dr. Schwartz himself was proof enough that a chubby and out of shape psychiatrist could become a lean, sculpted figure! His exploits of “strength endurance” are unparalleled in some ways. The scientific references that populate his books prove that Schwartz had found a way to drastically reduce the time and perceived effort of productive exercise! • Heavyhands can be practiced for relatively long periods, i.e. between half an hour and two hours at a time, or in 5-10 minute “exercise bites” throughout the day. Still, some people recognize the value of Dr. Schwartz’ work still today. For them, HeavyHands weights are occasionally still available on Ebay.com … their supply is sporadic and the selection of weights is generally pathetic. Thankfully entrepreneur Michael Senoff of WeightedHands.com began producing replacement weights and also specialized ergonomic handles for “HeavyHands” exercise, the prospects for finding new equipment were virtually nill. Now, thanks to Senoff, the HeavyHands enthusiast can progress from the smallest weights used at the beginning to the heavier weights required for maximum strength endurance development. Finally, people are able to progress as far as they want using HeavyHands. Once again, Dr. Schwartz’ proven methods are helping a new generation of exercise and weight loss enthusiasts.